Effective questioning is a researched-effective approach to mathematics teaching that directly impacts student interest and willingness to pursue tasks. In this study, we found that examining, planning and executing effective questions has immediate impact on the level of student engagement and achievement. Teacher participants were the creators of the questions they used, rather than using externally-created questions; the strategies became their own and were integrated into regular and on-going teaching. Through the Ministry of Education Math GAINS initiative, the Halton District School Board had the opportunity to guide a critical mass of teachers of mathematics through job-embedded professional learning experiences that shifted their questioning behaviours in ways that quickly led to improved student achievement and closed gaps. This Digital research paper reports on a conceptual model for effective questioning in the mathematics classroom that was tested for effectiveness. Does the approach to questioning used by teachers in the classroom promote student understanding of mathematics - resulting in increased student achievement? maintaining a high cognitive level for all students, mathematically strong or struggling. 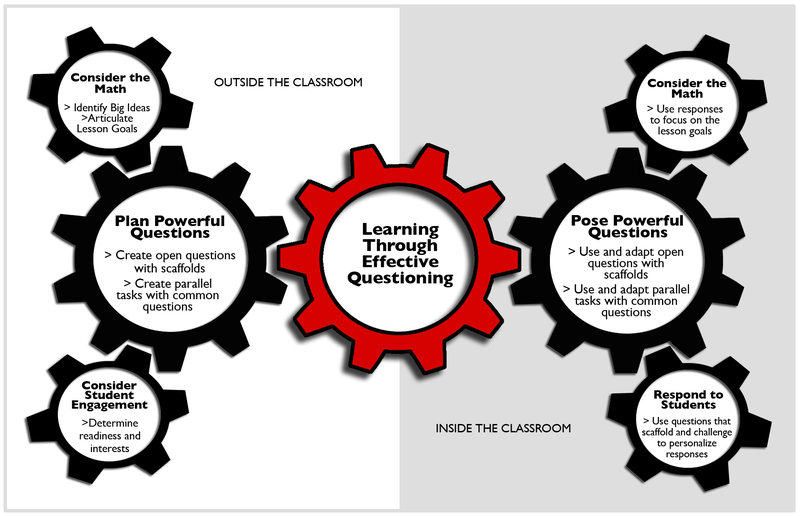 Through collaborative work including co-planning, co-teaching and debriefing , teachers developed their own emerging knowledge of questioning, enhancing their questioning practice. The research results clearly showed that students of teachers who were involved in improving their use of questioning in the topics algebra or number sense made significant gains from the pre to the post assessment – a finding that was not observed in the comparison group. It is also interesting to note that students of the questioning teachers showed significant improvements in both strands although only focused on one strand during the questioning intervention. The increases in student achievement demonstrated the ease of transferability of teacher practice to other areas of the mathematics curriculum. Teachers in the project used questions both to describe or set tasks as well as to scaffold and consolidate the learning. A single open question or a pair of parallel questions were often used to define the major task for students to pursue. But questions were also used to foster student discussion of their thinking on the questions and to determine to what extent and in what way the big ideas that led the teacher to set the task were understood by the students.